I have not been on line for three reasons… 1/ I crashed the hard-drive on my laptop and had to have it replaced… I can kill any computer faster then anyone I know…. 2/ The satellite dish was knocked out of alignment during a summer hail storm and it took us forever to figure out that it needed to be repaired by the service. 3/ I have been sewing up a storm. I do not have enough time to be on the internet and blog and sew…. so sewing run out. Carol W on twitter sent me a bunch of really neat fabric to go in my black and white quilt. I got a really neat piece of tiger fabric. I did a raw edge applique from the fabric. I had taken classes years ago on raw edge applique and was leery but after a couple of weeks of thinking about it and finding some really interesting grass fabric I dove in. Here are pictures of my attempt. I did some thread painting but it is hard to see as the threads were very similar to the fabric. 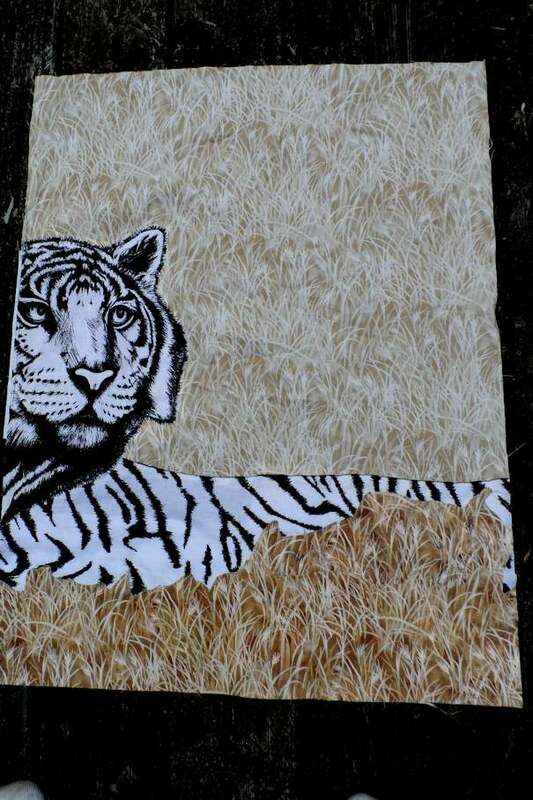 I had planned for this panel to go in my DH’s quilt but after some derogatory comment he made about my efforts…(He did not like the tiger) I am not going to put it in his quilt. I will probably put it into a nephew’s quilt. Step one: First attempt at thread painting. 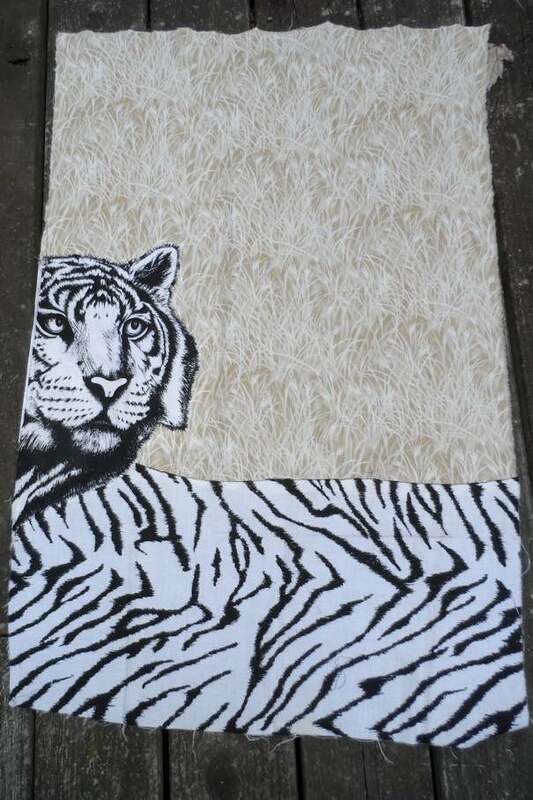 So dear old derogatory hubby is going to get a plain old quilt instead of nifty tiger quilt. I have made up my mind about the background fabric. I have been dithering between black/ charcoal fabric sashing and a deep red sashing. Hubby came home early from a fishing trip and caught me laying out the blocks. He said he really liked them. When I showed him the sashing fabric he really liked the red sashing. He thinks this quilt is for a nephew… but it is really for him. So since he liked the red fabric I will be using that… but I am going to be sneaky and put some strips of black and charcoal sashing around and I will hide the blocks with the red sashing. He will not be home when work on it as he is going out of town for a week and I will assemble the blocks when he is gone. Here is a picture of the blocks. I am having a blast putting the blocks together. I can sew each block in less than 10 minute and most of the time is used picking the accent fabric. The pattern is from my Craftsy class Pre-Cut Piecing Made Simple with Camille Roskelley. It is called PIECE OF PIE, one of three modern quilt patterns demonstrated in the class. I am enjoying the class and look forward to making a SWOON quilt in the future. Most of the instructions given by Ms Roskelly is spot on, but her method of cutting fabric using the cutting mat for measurement drives me nuts. Any time I had tried that method in the past it lead to disaster. I will stick with the old fashion measuring methods using quilt rulers; as I think they are more accurate. I did like her organizational sewing techniques. Much more efficient then the way I usually sew. Here is a picture of my blocks. I used 12 inch squares to start with as that is what I had from other projects and I did not want to cut the blocks down to 10 inches to equal the size of a layer cake. I found a student project done in neutrals on the Craftsy platform and it inspired me to do a similar quilt. Where I differ is the choice of sashing which is red. All my fabrics were cut from stash fabric. 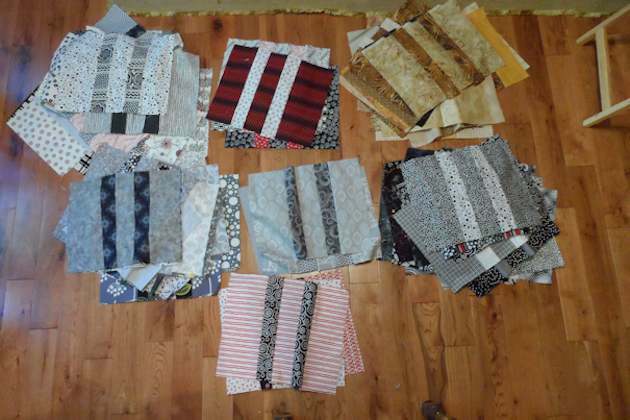 So far I have sewn about 90 blocks and I will be sewing another 20 block as I already have them cut out. I will not need that many blocks but left overs will go into a second quilt as we always need quilts during the winters here in Michigan. PIECE OF PIE BLOCKS…. 100 going on ?? ?